Our designs are optimized to automatically scale to fit the screen size of any smartphone. Our designs are also optimized to work in an elegant fashion on smartphones that will help drive conversions. Tablet sales have outpaced desktop sales. Microsoft’s revenue is hurting because more and more people are turning to tablets to replace their desktops and laptops. On a tablet, you can do just about anything you can on a desktop. But is your site designed to work on tablets? Our designs are. They look great on tablets. Even though mobile devices are overtaking desktops and laptops in usage, people are still going to be accessing your site the old fashioned way. Our designs will look great on desktops and laptops. It doesn’t matter what you use to view our designs. They will look good on whatever device you use. We don’t take any shortcuts with our work. We want to be sure you get more customers and have happy users. Our designs look great on all devices. 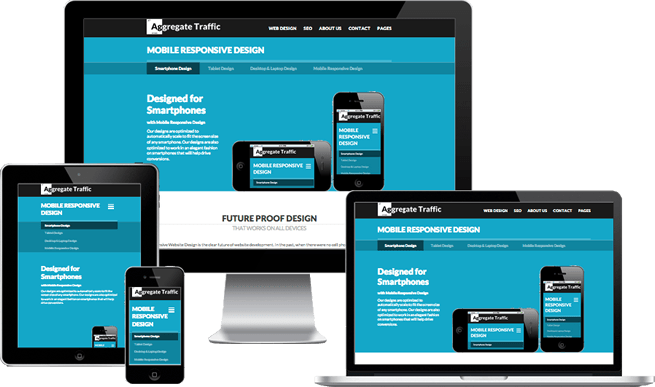 Building Mobile Responsive Websites is the clear future for website development. When cell phones and tablets were not common devices, web designers only needed to have their websites look good on desktops & laptops. Now, screens are smaller, netbooks & laptops are more portable, cell phones and tablet devices are becoming more commonplace and website design has had to adapt. The solution to this problem used to be solved by creating a separate version of a site that would auto-load correctly on smaller screens. In the past a website would detect when it was being accessed by a mobile device and would then serve that device this second version of the site. Although this solution has worked in the past it is now presenting a new set of problems for both users and developers. Moving forward to 2015 and beyond, where building websites tailored for mobile responsive design is the future, one single website is built and designed to render perfectly on as many devices as possible. Everything including desktop computers, notebooks, tablets, and smart phones are taken into account when designing and building the website. Responsive website technology makes it easier for your customers to interact with your website and understand your marketing messages. A perfect example of a mobile responsive design is this website. Ohiowebagency.com was built to accommodate users on all types of modern day devices. Google & Bing search engines have now specifically told webmasters and website designers that the websites they build need to be mobile responsive as a best practice. Typically, mobile responsive websites are more expensive to build as they take extra time for a developer to implement this new technology. However, when you consider a mobile responsive design as a long term solution, it ends up saving precious time and money in the long run. Several leading research reports forecast that 2015 will be the year that the combined sales of cell phones, tablets, and other mobile devices will eclipse the total sales of desktop & laptop computers. The entire idea of having a strong digital presence is to get your messages, products, and services in front of as many people as possible. It is time to prepare for the digital future, contact us now for a free custom mobile responsive design price quote. 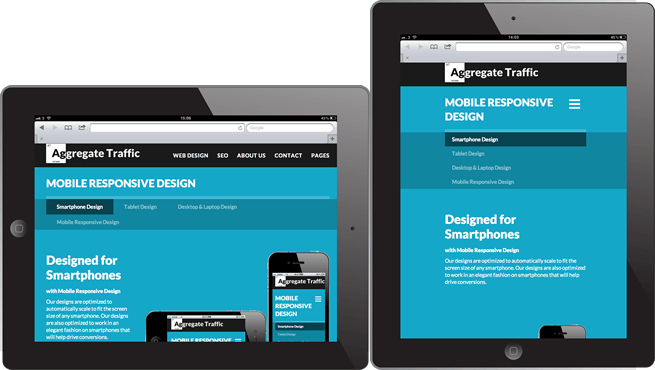 Get a free Mobile Responsive Website Design consultation. 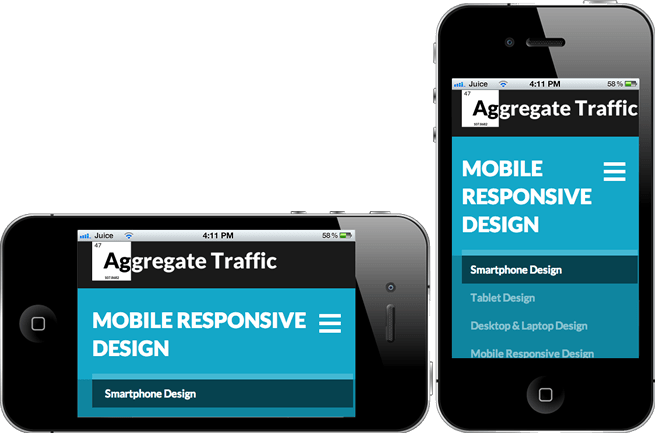 We build functional Mobile Responsive sites that look amazing on every device. Let us build your site for tomorrow and beyond.